Sunday Morning Soliloquy - Musings of an Urbanite: I Just Found The Google Wonder Wheel! I Just Found The Google Wonder Wheel! Last week I was looking for some free keyword tools, so I sent out a tweet to a few of my most trusted SEO/web marketing friends (@jasonrubacky @SeanMcGinnis @AirDisa and @Daver). I received several answers, below is a short list, but my new favorite is GOOGLE WONDER WHEEL! Just to give credit where credit is due, @AirDisa suggested the Wonder Wheel. *I believe the last three are paid (not free) tools. If you don't already know, I search myself non-stop online, in fact, I believe I invented the Vanity Search. 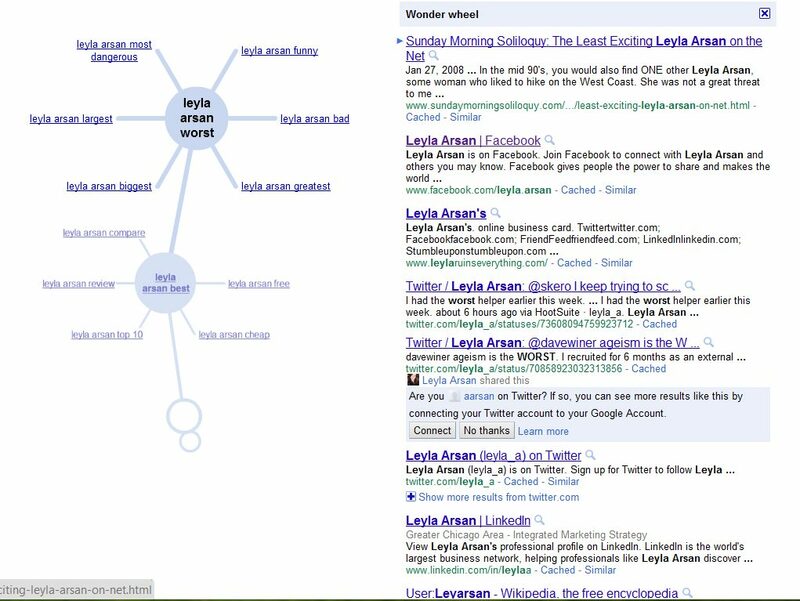 Several years back, when I was the only Leyla Arsan on the internet, I would search myself often to see if anything new popped up. 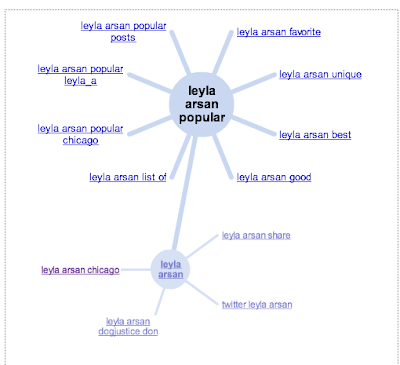 Then a new Leyla Arsan showed up on Google and punted me back several pages (you can read more about that here - The Least Exciting Leyla Arsan on the Net). To add to the Vanity Search fun, I decided to try out the Wonder Wheel using my own name. I quickly become involved, spinning and spinning that wheel. 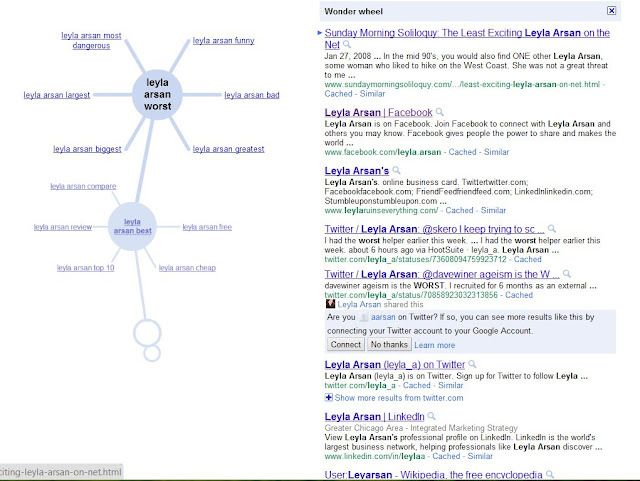 Click on "More search tools"
I started with my first and last name, hit search and then clicked on wonder wheel. I clicked on Leyla Arsan Popular, and kept clicking until I got.... Leyla Arsan WORST. But my favorite was "Leyla Arsan Dangerous" - I did not get that far, but I wonder what would have happened if I clicked on that. Google Wonder Wheel is great fun. I hope you enjoy! That was odd but fun! I agree. Now I want to try it with "Howard Stern" and see what happens!